An engineer has shown how you can sneak a tiny cellphone base station into an innocuous office printer. The idea is the brainchild of New Zealand’s Julian Oliver, who was inspired by the Stingray cellphone snooping technology now in widespread use by the cops and FBI. He was looking to see how such tech could be hidden and what better to do this in than the humble office printer. The system uses an HP Laserjet 1320, which is both in widespread use around the world and also has a good amount of free space inside the casing. 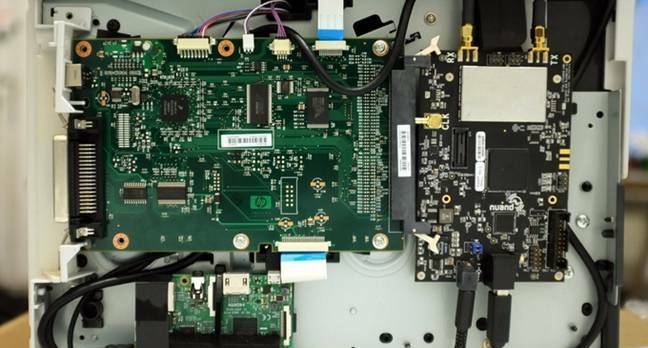 Oliver then added a RaspberryPi 3 and BladeRF x40 software-defined radio, along with a couple of antennas and some cabling to link into the printer’s power supply. The whole kit forms a tiny cellphone mast that masquerades as a legit tower. The printer still does its main job of spewing out documents, but now – using code Oliver developed and published – it also acts as a fake cellphone tower that detects and communicates with nearby phones and sends them SMS messages. The computer also harvests the IMEI number for the phones and whatever else information it collects from the devices when they automatically connect to it. He rigged it up so that this information is printed out, and the phone will also receive a random call that plays them Stevie Wonder’s I Just Called To Say I Love You. While the printer in its current design doesn’t have malicious intent, it would be easy to set it up to pump out SMS malware or possibly perform man-in-the-middle attacks against unsuspecting workers. It would also make a very useful surveillance device.